Motherwell fans’ generally delighted reaction to hearing that veteran midfield star Keith Lasley is to keep playing for the club next season ended speculation about the skipper’s possible departure. 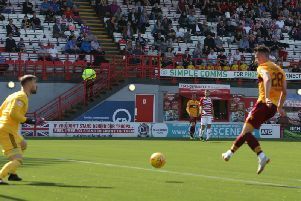 And Lasley – who turns 38 in September – recently told the Motherwell Times about his keeness to keep playing professionally for as long as possible in a sport which can leave a massive void in people’s lives after they do finally hang up their boots. Midfield genius Paul Gascoigne, for years blighted by severe alcoholism and psychological meltdowns, is perhaps the most tragic example of how the dream life of playing for glamour teams like Newcastle, Tottenham, Lazio, Rangers and England can be so easily replaced by depression, loneliness and non stop boozing in later life. And Paisley-born skipper Lasley, who has made over 400 Motherwell appearances, said: “Football and sport in general are tough mentally, especially when people are coming to the end. “It is not an easy transition to make, going from playing to retirement, so I understand why there are mental health issues among players. A noticeable recent trend in British professional football at the highest level has seen more and more players carrying on with their clubs until around middle age. And Lasley thinks it is unsurprising that an improvement in players’ diets and conditioning in recent years has seen an upsurge in the number playing at the peak of professional football until their late 30s or early 40s. “It is no surprise that guys like Davie Weir, Ryan Giggs and Kenny Miller have been able to go on for many years,” said the ’Well skipper. “I think this will be a growing trend, as the game has moved on with the introduction of special diets and sports science. “There are no excuses now for players to not go on until around the 40 mark if they want to do it. “I have been lucky with injuries over the years.